We emailed y’all about our new orchard grant opportunity and some financial setbacks our farm has experienced this summer that could hinder our ability to get this project off the ground this fall. Some of you have donated to support our farm, and for that we are so immensely grateful! We would love for you to check out the details of this orchard project we hope to be able to begin soon and donate to our fundraiser. We’re gonna need some help to get there! Now for a garden update: As we’ve mentioned before, when median temperatures rise (average of daytime and nighttime) the crops cease to create new fruit, as the flowers are sensitive to hot temperatures. 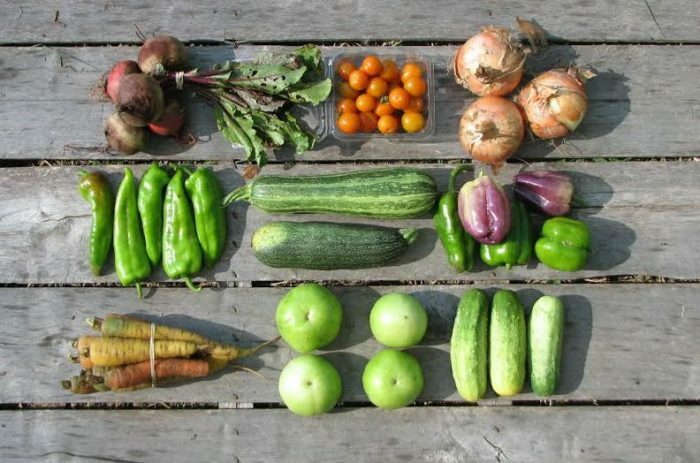 In early June it was so unseasonably warm that the eggplant, peppers, and tomatoes didn’t produce new fruits. Now in early August we have harvested almost all the mature fruits from that family of crops (all other crop families are doing fine!). We had an unseasonably cool and rainy spell in mid-July and then again cool temperatures today so it’s been interesting to see the plants covered in teeny tiny new fruits recently. We aren’t sure how long they will take to reach maturity. if it isn’t soon, then the CSA will come to a close in a week, maybe two. But if they ripen soon, it could potentially mean that the summer harvest is extended a bit longer than normal! If not, then we hope it means we can begin the fall season a little early. 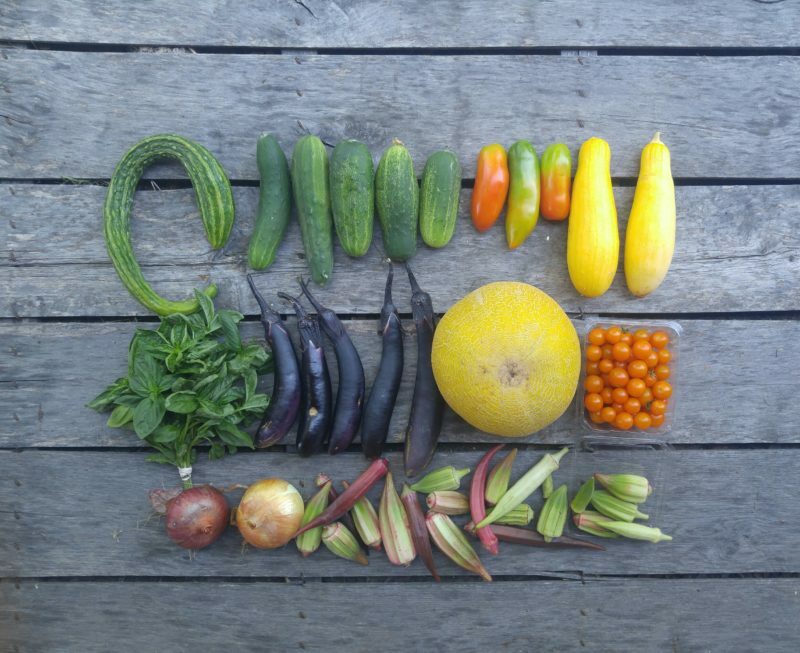 The Fall CSA, which is now open for you to get registered, can be joined by following this link here to sign up. In fall harvests you can expect some summer-like crops early on, with loads of root crops, sweet potatoes and winter squash and lots of leafy greens to follow soon after. It’s our most diverse season! Harvest begin sometime in October and typically run right up until Christmas. Yellow squash—These are still kicking, but we definitely have harvested less than last week. We have another planting of squash and zucchini that might be ready in a week or two! Basil—Genovese Italian Basil is perfect for pesto! Okra—Mixed bundles of our 4 beautiful heirloom varieties. Which is your favorite? Eggplant—Large shares received our Fairytale Eggplant, and small shares received either Japanese or Italian Eggplant. Again, cooking at high heat is the way to go with eggplant, roasting, griddle frying, or grilling. Cucumbers—prolific as ever! 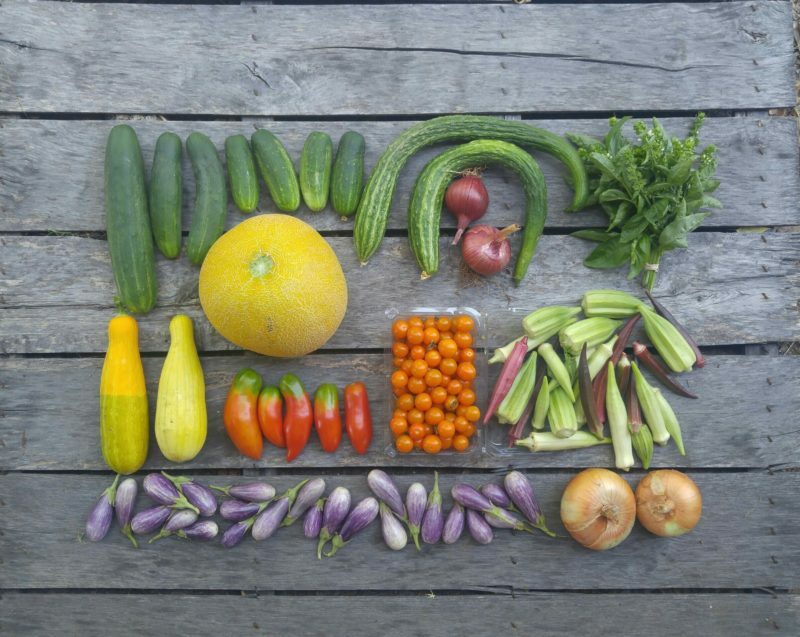 We’ve got three varieties for you this week, the Chinese Seedless, slicing, and pickling. The English Seedless are actually a Chinese seedless variety! I’ve been getting it wrong all this time! Justin joked that I should tell you the name became unavailable because of Brexit. To which I responded that we’d still need to pick a different name because of Chinese Tariffs. **rolls eyes at the corny jokes**. Onion—A couple of yellow and red onions. Sungold cherry tomatoes—As sweet and juicy as ever. As it heats up they will begin to diminish in quantity and quality so enjoy them while they’re awesome. Ripe tomatoes— We don’t have a lot, but between our slicing types, as well as the addition of our San Marzano Roma variety, we’re able to give everyone a few red tomatoes. One of my favorite late summer treats is a savory tart made with roasted eggplant, San Marzanos, tasty cheeses like feta, chèvre, or mozzarella, and loads of eggs. This one‘s graced our table a time or two and doesn’t disappoint. If you received any that are slightly under ripe, just set them on the counter, shoulders down, and they’ll be ready in a few days. Any cracked tomatoes should be eaten first. Remember, don’t store your tomatoes in the fridge, they hate cold temps! Melon—Arava melons are like a cross between a cantaloupe and a honeydew with lovely green flesh. They’re one of our favorite melons! Chill and enjoy. Onions, basil, and tomatoes will all prefer to stay at room temp. Tomatoes begin to get mealy and basil turns black if stored any colder than 55 degrees. The cucumbers, squash, peppers, and eggplant like to be cool but not cold. They can be stored at room temp if you’ll be eating them fairly soon, otherwise put them sealed up in the fridge if you won’t be getting to them for a few days. They last quite a long while in the fridge. Everything will need a gentle washing before cooking, but leave the dirt on until you’re ready to use them to prevent faster spoilage. (3rd row) red onion, yellow onion, heirloom okra.